There is one thing contrarian about the Festool RO90: the dust collection holes are not the same size as other Festool sanding disks and pads. 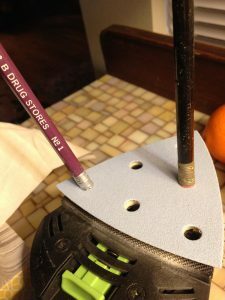 I’ve written before about using disposable foam paint pad handles as guides for installing sanding pads. A 3/8″ dowel works the same. The RO90’s holes are smaller, so I looked for the perfect guide and settled on a good old #2 pencil. Now, you’re probably not lucky enough to have a good old #1 Katz & Besthoff pencil, because K&B Drugstores got bought out in 1997 by RiteAid. But Brenda, seeing the end of the classic purple pencils coming, stocked up. No, I won’t tell you where her stash is. A standard pencil allows you to line up the dust collection holes perfectly on your RO90, whether using the round or triangular attachment.